Tobacco smoke presents one of the most difficult tasks for a portable air purifier. In addition to removing large smoke particles, the filter must be capable of removing odors and hundreds of chemical and gaseous contaminants while retaining them within the filter. We strongly believe that the best available technology to remove environmental tobacco smoke is activated carbon. To learn more about activated carbon, click here. While almost all of our Austin Air and Airpura air purifiers contain activated carbon filters, certain models are better suited for smoke removal. The greatest factor in smoke removal effectiveness is the volume of activated carbon present in the filter. Furthermore, certain models contain specially impregnated carbon, secondary tar filters, or other technologies to assist in the reduction of certain contaminants found in tobacco smoke. Of course, consideration should also be given to your budget, the size of room you wish to treat (air processing rate), the removal of other contaminants, and filter life. 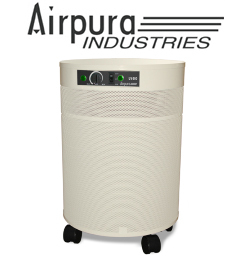 Our top choice is the Airpura T600. Designed specifically to remove harmful contaminants from environmental tobacco smoke (ETS), the Airpura T600 features a specialized TarBarrier pre-filter to remove tars as well as an extra large 3" activated carbon bed (26 lbs of carbon!) to remove most known chemicals and gases found in tobacco smoke; these include at least 60 confirmed carcinogens. A HEPA-grade post filter removes airborne particulate matter. It also has an excellent air handling rate of 560 cublic feet per minute which results in faster air turnover after recontamination of the room. Other models that are recommended by our staff for tobacco smoke include the AirPura V600, Austin Healthmate Plus with Superblend, and Airpura C600.